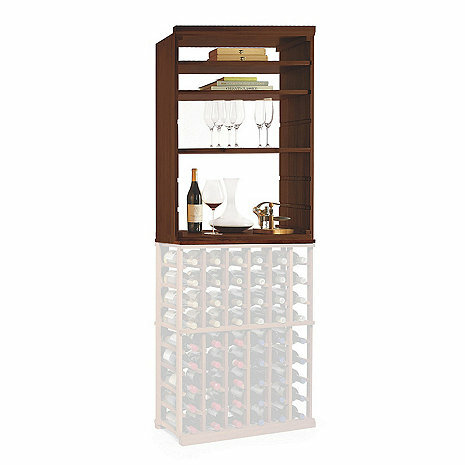 This Hutch with Shelves Rack Kit holds up to 3 shelves, displaying your favorite accompiaments for any wine collection. Hidden pre-drilled fasteners make assembly easier, leaving no unsightly screws or holes in the most visible areas. No putty needed. Base and crown moldings (included) provide a more finished "custom" look. Screwdriver not included. Nail gun and miter saw recommended only for applying optional face trim to Solid Diamond Cube and Diamond Bin Racks. Assembly time and difficulty level varies depending on racks purchased and skill set of each individual.